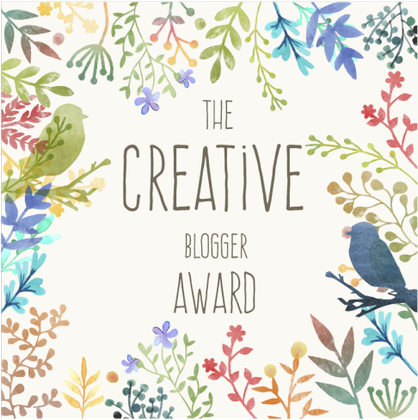 Wow, I’ve been so busy recently that I’ve not been able to properly thank Kristy from Palatable Adventures for the lovely nomination for Creative Blogger. So big THANK YOU Kristy!!! When I started blogging I didn’t think any one would read my blog, so I’m over the moon that not only have I been meeting lots of lovely new people but that you guys have been following and enjoying my blog too. I am really enjoying Kristy’s blog, and finding out about her life in Texas. Her love of her family really comes across in her posts. She has great recipes and is setting herself the challenge of teaching herself and her girls new recipes. What a great Mum! Oh and she’s not afraid to put up her wedding photo on her blog! I am terrified of flying! I’ve stayed in a Yurt. I wear my mums engagement ring on my right hand. Nominations- this was the difficult bit as there are so many great blogs that I follow! I don’t know if you guys take part in nominations and if you can’t or don’t want to that’s cool. I must admit I wasn’t too sure about doing nominations/ Award thingies as there is an element of chain letters about them ( remember those??) and I didn’t generally do those. I do remember some chains would threaten bad luck if you broke the chain! Eck!!! However, I would imagine that the spirit behind nominations and these awards are to encourage bloggers and show others how much you enjoy their blog. Its a acknowledgement of all the hard work that goes into blogging, and it’s brill that other bloggers have taken the time to tell you ( me) this, so I decided to give it a go. Also I am using it as an opportunity to let you guys know that I think your blogs are fab. Keep up the good work everyone! Frugalhausfrau– She comes up with great, mouth watering recipes. I’ve tried a few of her recipes and loved the results. Lynzrealcooking– Her writing captures her emotions and paints the events in her life so vividly. She is one brave woman.Not too mention her recipes are awesome. A Texans view of upstate New York– Great blog about the life and adventures of an musical army wife. Life in mud splattered boots– Anne lives in the country too, but at the opposite end of the country from me. I love reading about she gets up to on her farm and her recipes. Photos are great and captures the lovely countryside she lives in well. Pennys food blog– Every post looks so so yummy and the recipes are varied and easy to follow. Have book marked many of her recipes and hope to get around to making some soon. Nominate 5 bloggers and add their links. < Previous No Churn Crunchie Ice Cream and No Scottish Summer! Congratulations on your award. It is always nice to learn a little more about the people we meet in the blog world. Now I’ll be off to visit your friends. By the way, love your food creations! I also enjoyed looking up the blogs that you love and nominated! Thanks for participating!